Karibu, Welcome to Kilimanjaro Adventure Travel, the Internet source for African travel and information. We have selected dozens of tour operators and hotels to bring you a variety of exciting safari destinations. Whether your interests include wildlife safaris, gorilla treks, mountain climbing, white water rafting, or scuba diving, we have something for you. After 10 years of respite, a new assault was perpetrated last August against mountain gorillas and their very chances for survival. Visit our Gorilla Help Site for more information. 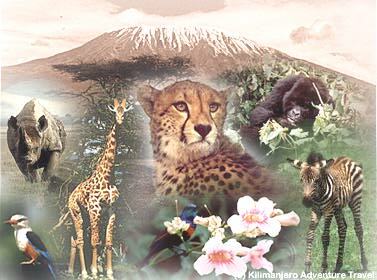 Kilimanjaro is dedicated to helping protect Africa's wildlife and environment. If you book a tour with us, you will be helping too, since a portion of our profits is donated to animal protection agencies, such as the Rhino Ark, Berggorilla & Regenwald Direkthilfe (B&RD, or Mountain Gorilla and Rain Forest Direct Aid) and the World Society for the Protection of Animals (WSPA).